We’d love your help. Let us know what’s wrong with this preview of The Illustrated Encyclopaedia of Arthurian Legends by Ronan Coghlan. A study of Arthurian romance and legend which draws together the different strands of Arthurian myth, from sources as diverse as Geoffrey of Monmouth, Malory, Chretien de Troyes, the Mabinogion, and the English Gawain cycles. To ask other readers questions about The Illustrated Encyclopaedia of Arthurian Legends, please sign up. Often plundered and even plagiarised – frequently online and most notably in print by Mike Dixon-Kennedy in his Arthurian Myth and Legend: an A-Z of People and Places (1996) – this was the first really accessible dictionary of Arthurian personages, locales and other miscellanea. While not an academic publication the Encyclopaedia at least references most of its entries (unlike its main rival, mentioned above) while still striving to be user-friendly. This original edition includes full-page line Often plundered and even plagiarised – frequently online and most notably in print by Mike Dixon-Kennedy in his Arthurian Myth and Legend: an A-Z of People and Places (1996) – this was the first really accessible dictionary of Arthurian personages, locales and other miscellanea. While not an academic publication the Encyclopaedia at least references most of its entries (unlike its main rival, mentioned above) while still striving to be user-friendly. This original edition includes full-page line drawings by Courtney Davis in a neo-Celtic style, but soon gave way to a fully-illustrated full-colour coffee-table edition which must have sold in even more numbers. Entries are sometimes terse but rarely uninteresting, and relatively easy to cross-reference. There are family trees, some in variant versions from differing narrative traditions (for example Welsh, German or French); and a few maps, though these are rather basic. Coghlan, though an idiosyncratic author (his books range from Robin Hood to cryptozoology, from Sherlock Holmes to an excellent dictionary of Irish Christian names) is an enthusiastic Arthurian, no doubt aided by his stint as a dealer in secondhand and antiquarian books trading as Excalibur Books. This is most useful as a ready-reference book for those more obscure Arthurian sites and personages, and its list of consulted books is still useful if now a little dated. 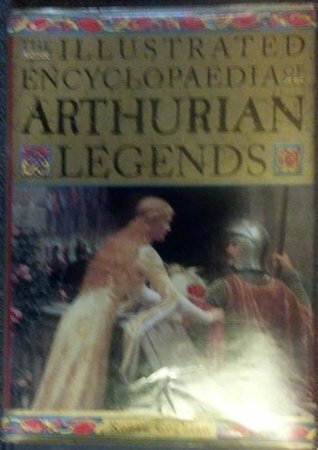 As this is primarily a sourcebook of legends there is relatively little on literary works of more recent centuries, but Coghlan is strong on Arthuriana up to and including Malory, though he does include a few notices of later folklore and popular tales. Even for seasoned Arthurians there is much of interest here, and it’s consistently reliable (which is more than can be said for the Dixon-Kennedy rip-off). Thi is a great reference guide to have kicking around if you like Arthurian legends. Just having it from the library isn't good enough. I hope to own it one day because it is truly an encyclopaedia so it isn't something you can just read from start to finish though I tried. I found that I learned a lot and was often looking up things mentioned on Wikipedia as well to learn more if the references to a person/event were too brief. Great reference tool for all things Arthurian. Some portions felt a bit confusing, but that was to be expected, given the myriad of different tales and spin-offs surrounding the mythical figure. The stories, for example Sir Thomas Malory's Le Morte Darthur, feature a wide cast of characters, so it's quite handy to have an encyclopedia like this to check who's who. Goes to show how difficult it is to say who was/is King Arthur. While it gives you a good overview of the contents of the Arthurian Legend, and includes pretty much all the persons and many places, I feel like it could have been more detailed. But if you want to look up quickly who's who, it's a good choice. This is a gorgeous book, offering an alphabetically-organized journey through the matter of Arthur from the fifth century to the nineteenth. As an adolescent besotted with the legends, I adored this volume. It is both more scholarly and more beautifully produced than some similar works, and it still holds a place on my shelves. Formatted for people who love all things Arthurian, nice pictures, some good information. A reference for the pop culture of symbolism. If you want to know where the Lady of the Lake really came from, see my blog at www.whiteknightstudio.com. Read "The Lady of the Iron Sword". But all in all a nice book. Quite boring of a read--though I guess it is an encyclopedia! Informative IF you have context. I feel you'd get more out of this if you were very familiar with the source materials. If you haven't read the sources, you may find yourself a bit confused. I'm not a huge fan of medieval literature or the Arthurian legend (I enjoy military and US history more than anything). This still an interesting book to read through and learn about the numerous tales and characters. The first birthday present my wife ever gave me (we were only dating a few months in at the time) and is one of my favorite books of all time. Best reference book ever. Gorgeous illustration, but the content would probably only interest an arthur fanatic or a scholar of medieval literature. A good and solid Encyclopaedic reference with a varied asortment of paintings and illustrations. One of my favourite Arthurian books. It includes some good discussion of the more obscure knights and their adventures; but it was lacking in references and other sources. The audience clearly is not academic or college-level. perhaps not the most scholerly of books but i do love it. perhaps because it was a gift from my father when I was a girl. I can't tell you how many times I have used this book as a reference. I only wish there were more information on some on the entries. Gret resource. “How are we to account for the vast interest to be found in Arthurian literature today, an interest embracing both the academic and the common person?